Jarmo is the Chief Innovation and Technology Officer of the Future Cities Catapult, leading the research & innovation agenda, academic partnerships and strategic collaborations. Jarmo is an expert in smart cities, open data and open innovation, with background in architecture and urban events. Before joining the Catapult in 2016, Jarmo was the founder and the CEO of Forum Virium Helsinki – the urban innovation lab of the City of Helsinki – since 2006 and led the Media Centre Lume of the Aalto University 2001 – 2006. 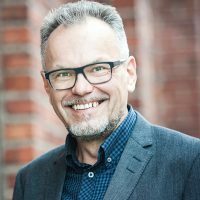 Jarmo is the vice-chair of the international Open & Agile Smart Cities network OASC, member of the Smart London Board, board member of Open Knowledge International and a founding member and former President of the European Network of Living Labs ENoLL.